What is Zambia's premier national park? The South Luangwa of course. And why? Because the Luangwa lures! Take a seventy-five minute flight from Lusaka International Airport and voila, you land at the International Airport in the National Park. Don’t be surprised. customs and emigration facilities exist for those who fly in straight from abroad. But what’s so special about this park? The South Luangwa National Park has probably the largest variety and concentration of game in Africa and perhaps in the world. It’s a vast wildlife sanctuary. Experts have pronounced it to be one of the finest viewing areas. South Laungwa National Park is located in the Luangwa Valley. This is an extension of the East African Rift Valley System. The park is about 50 kilometers wide and covers an area of 9,990 square kilometers. In the park the seasons are well defined. There are heavy rains between November and April. That means the lodges may become inaccessible. The most pleasant times of the year are the months of June and July when the days are warm and sunny. The evenings are great, crisp and clear. The park takes its name from the Luangwa River that meanders at the bottom of the valley on its way to join the Zambezi River. This meandering creates ox-bow lakes, which keep shifting year in and year out. As sources of drinking water the lakes attract droves of wildlife …and birds too! Birdcalls are a common feature as the air is always alive with their sounds. South Luangwa is home to over 401 different species including forty raptors. It’s an ornithological paradise! On any one single day’s visit you may happily ‘log’ at least one hundred varieties. Some of the more spectacular birds to be seen are crested cranes, saddle bill storks, egrets, wood ibis and vultures. Elephants are everywhere and it is practically impossible not to see them. The river lagoons are full of hippo, giraffe, buffalo, and numerous varieties of antelope, waterbuck, puku and kudu. Common predators are lions, leopard, hyena and wild-dogs. Lion - King of the Jungle! To the delight of photographers lions like to take to the trees and ‘pose’ on stronger branches. However, they’re normally seen in the late morning resting on the ground as the heat of the day increases. 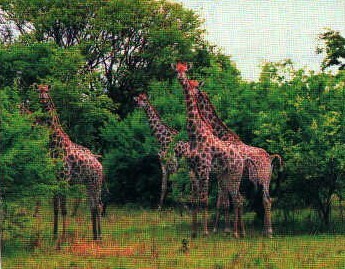 The park is also famous for Thornicroft’s giraffe and the Cookson’s wildebeest. The widest horn spread of 82.5 centimetres has been recorded on a wildebeest in the Luangwa Valley. The Luangwa River boosts greater numbers of the huge Nile crocodiles than any other river in Africa. Monkeys, of various types, baboons, and warthogs are also common. And unique to South Luangwa National Park are the game-viewing trips famously known as walking safaris. These safaris on foot provide a way to appreciate the savagery and beauty of the area. Walking safari areas have no roads. One gains to enjoy the scenic beauty enhanced by streams and lagoons. These daily game-viewing trails include an armed game scout. So it’s safe and provides numerous opportunities for close up photography. Norman Carr a former game warden introduced the walking safaris in the 1960s. He developed the concept of encouraging tourists to observe game at close quarters without the use of vehicles. There are also mixed-walking/driving tours made two or three times daily from many of the lodges. Rising at dawn one is availed the chance to see the sunrise spectacle of the elephants crossing the river. Night game viewings are also popular. These target various nocturnal animals that include the jackal, leopard, although normally secretive. Others are serval, ant bear, civet, wildcat and bush baby. On these safaris a lens of a camera rather a gun is what you use to shoot with. Many lodges arrange these tours and they can vary in length from 2 nights/ 3 days to 7 nights / 8 days. The make-up of groups is normally no more than 6 adults who are accommodated in comfortable camps, with all amenities and porters and professional game-guides. On these safari trails it is normal to detour to avoid the teeming game. There are all types of camps and lodges that cater for walking safaris. The smaller camps have accommodation in whitewashed, thatched-chalets more reminiscent of African style. They are still reasonably comfortable with supplies of clean linen, mosquito nets and refrigerators. Washing facilities are in separate blocks. At each camp, armed game-scouts are available to assist you with your viewing. One of the park’s main attractions is its up market facilities and amenities. Providing excellent lodges and camps from modest tented camps to rustic 5 star unashamed luxury with sumptuous modern interiors and superb cuisine. Some of the “camps” are said to be the finest safari accommodation in Africa. Electricity is provided at all lodges either by mains or generator so electrical appliances can be used. The water is safe to drink as it will have been treated or boiled. And then there is bottled mineral water too! There are a number of ‘comfort hints’ to help you enjoy your stay in the park and they include; the taking of anti-malarial prophylactic before, during and after your visit, insect repellent for the evening walks or for drinks on the verandah, insect spray for your room, although you will find that the staff spray them at regular intervals as a matter of course. Long socks are important if you intend going on walking trails, along with comfortable, stout, walking shoes. A cover for the head and neck and a good sun block are also essential requirements. Remember the camera and lots of film or the camcorder and binoculars. Replacement batteries are a must, as you don’t want to miss ‘the shoot’ of a lifetime. Once the sights and treasures of South Luangwa National Park have been discovered, aim and shoot. You’ll understand why Zambia is described as ‘the real Africa’.